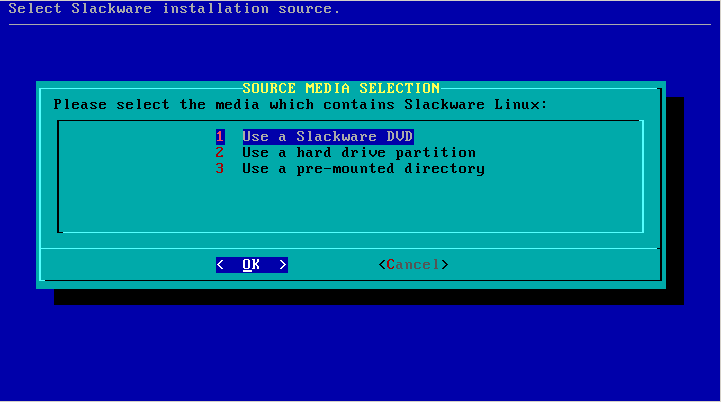 Insert the Slackware 13.37 DVD into the spare computer, and boot from the installation medium. 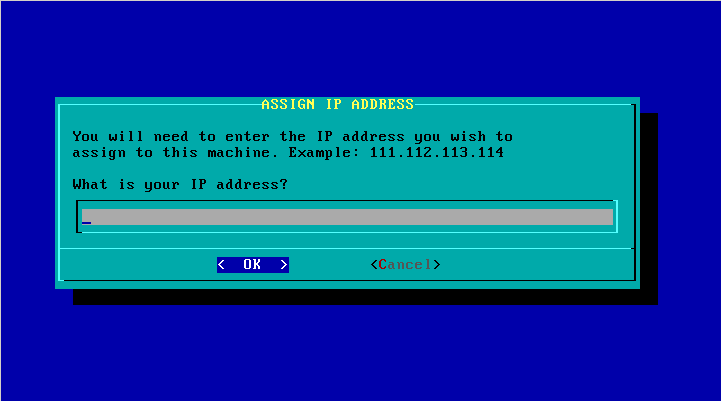 * Boot the spare computer from the Slackware installation medium, and when this ends with a login prompt (see screenshot below), login as “root” (no password required). There are four relevant main selections (apart from EXIT which will drop you back to the prompt): HELP, NETWORK, SOURCE and ACTIVATE. An explanation for these choices follows from the screenshots below, and you will see that there is surprisingly little for you to configure… it is very user-friendly. 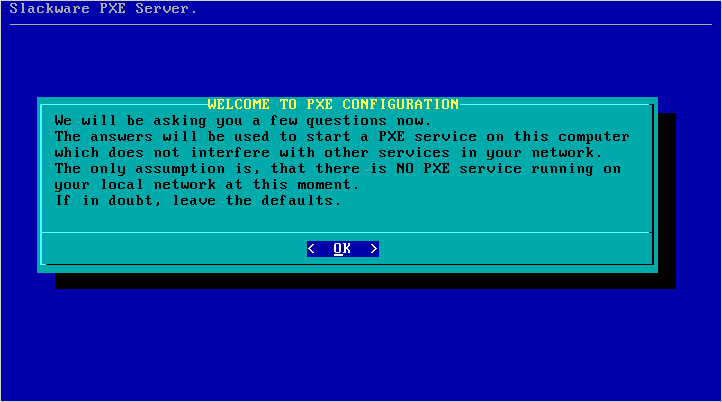 Use the NETWORK and SOURCE sections of the main menu to configure your PXE server. 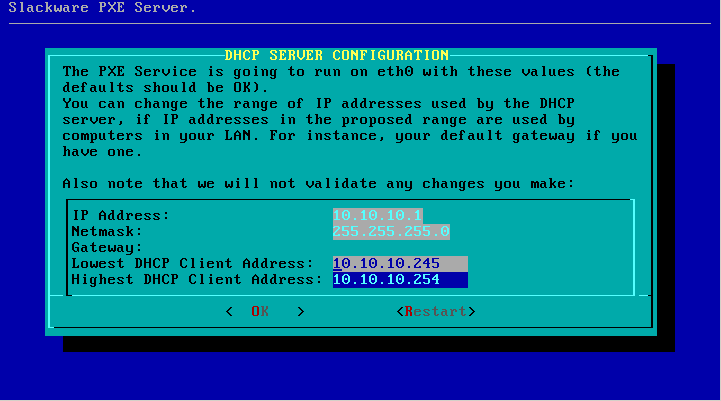 After the network interface has been configured, you will see a number of dialogs that let you determine whether the installer should start a DHCP server or not. 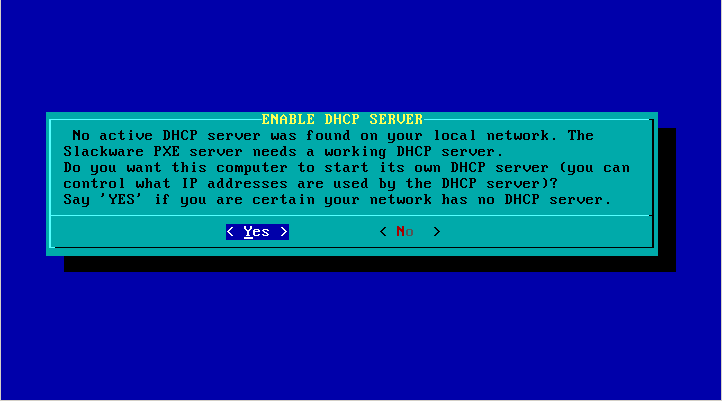 If your network already runs a DHCP server, then it should not be disrupted by a “rogue” DHCP server! You will have an angry network administrator at your desk in no time. The setup program tries to make an educated guess about the range of IP addresses to be used if it is going to start a DHCP server. A dialog will present the proposed configuration. There are two configurable items in that dialog: the lower and upper values for the IP address range that will be used by the built-in DHCP server. The IP addresses in this range will be available for the PXE clients that request a network boot configuration from the PXE server. Please check this address range, and if you think you have a computer in your network that uses an IP address in this range, you must change the values for the upper and/or lower values and resolve the conflict. This range of IP addresses must not be used by any computer on your LAN ! If you are satisfied with the values, select “OK” to continue to the next section. 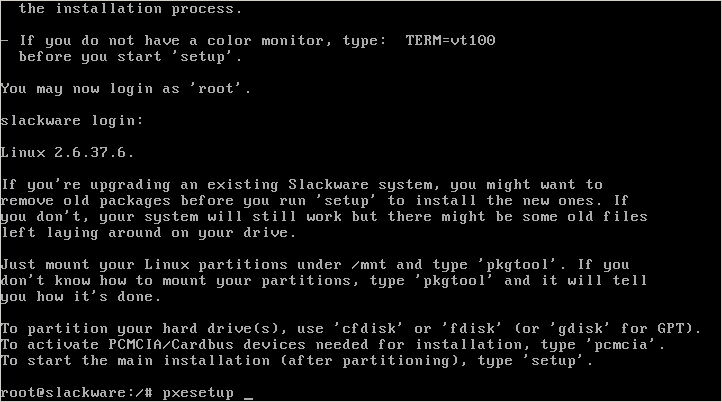 The pxesetup program will find the Slackware DVD or CD and that’s it! More information is not required and the PXE server will be started automatically. Another service is started as well at that moment: a HTTP server which will serve up Slackware packages to the clients that use our PXE server. 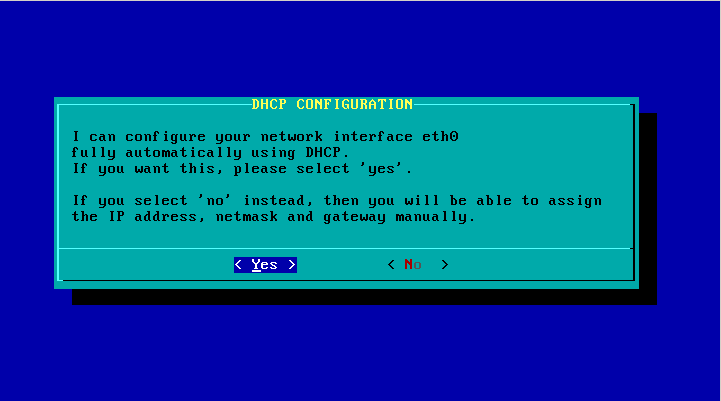 You can press the “EXIT” at any time, which will kill the PXE services (DHCP, TFTP and HTTP). You can then restart these services from the main menu again, by selecting the ACTIVATE entry. 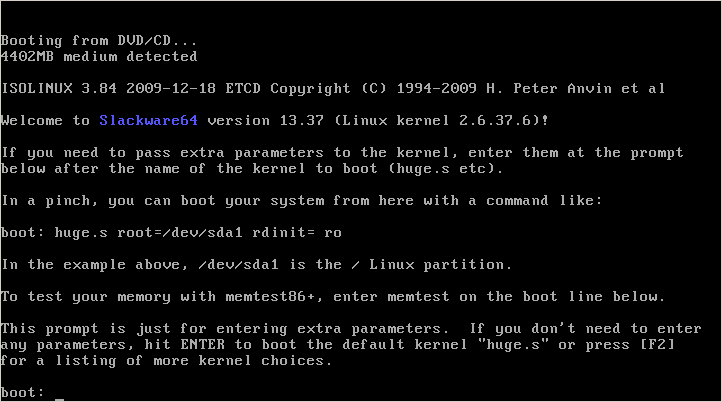 What happens next should all look pretty familiar: the Slackware welcome screen will appear and you can either press ENTER for the default kernel or make your own choice of parameters. The noteworthy part is where you get to select the package SOURCE. There is only one working option, and that is “Install from FTP/HTTP server“. After selecting this option, your computer’s network card will be configured using DHCP, and then you will notice that the questions for “URL of the ftp or http server where the Slackware sources are stored” and “What is the Slackware source directory?” have default values already filled-in! You should accept these values, since they are supplied by the PXE server! The remaining steps should be familiar if you have ever tried installing from a HTTP server before. The “usbimg2disk.sh” script which you find in the “usb-and-pxe-installers/” directory on the DVD or any Slackware mirror, contains some functionality for making it easier to run the PXE server off the USB stick. You need to create a full USB installer for this to work (“full” meaning that the USB stick is made bootable and all Slackware packages are copied to the stick). If you boot this USB installer, the vfat partition on the USB stick (which contains the Slackware packages) will be automatically mounted on the installer's directory “/usbinstall”. If you run “pxesetup” (or even if you run the normal “setup” by the way) and get to the point of selecting the package location in the SOURCE menu, you must pick option “3: Use a pre-mounted directory“. Actually, that item will be the default choice! When you select that option, you will notice that a value for that directory name has already been filled in. All you have to do is to accept that directory name and you are in business.